Just when Ebola and the hype surrounding it couldn't get any more confusing, in a wild statement made by the World Health Organization on Thursday there were stark discrepancies written in terms of what Airlines should be doing, and not doing to protect the world from an Ebola outbreak. "Because the natural reservoir of ebolaviruses has not yet been proven, the manner in which the virus first appears in a human at the start of an outbreak is unknown. However, researchers have hypothesized that the first patient becomes infected through contact with an infected animal. During outbreaks of Ebola HF, the disease can spread quickly within healthcare settings (such as a clinic or hospital). Exposure to ebolaviruses can occur in healthcare settings where hospital staff are not wearing appropriate protective equipment, such as masks, gowns, and gloves. At this time, it is INCONCLUSIVE as to the exact spread / transmission of the Ebola Virus. It is recommended by the CDC that TRAVEL TO SIERRA LEONE, NIGERIA, LIBERIA BE RESTRICTED! This is due to the UNKNOWN nature of the Ebola Virus and how it is transmitted. In fact, IT IS DISTURBING that the World Health Organization is publishing that it can ONLY be transmitted via contact. THIS IS NOT TRUE as multiple scientific Journals have published, peer-reviewed articles with medical experts stating that Ebola CAN BE TRANSMITTED VIA AIR DROPLETS... this is the very reason healthcare workers are required to wear FACEMASKS! It is difficult to know what illness a sick person has on an airplane without further evaluation and laboratory testing. Therefore , cabin crew should follow routine infection control precautions for ill travelers identified during flight. 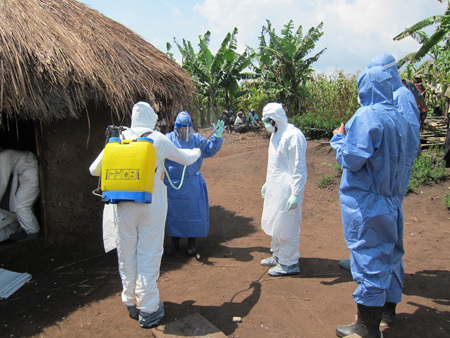 Although Ebola does not spread through the air, these routine precautions include management of travelers with respiratory illness to reduce the number of droplets expelled into the air. If the sick person is coughing or sneezing, provide a surgical mask (if the sick person can tolerate wearing one). If a mask cannot be tolerated, provide tissues and ask the person to cover mouth and nose when coughing or sneezing. Provide a plastic bag for disposing used tissues. Provide an air sickness bag if traveler is vomiting or reports feeling nauseous.